Patients receiving particulate contamination through parenteral delivery of biopharmaceuticals presents a significant potential health risk. However, the severity of that risk often is unclear. It depends on the route of administration, dosage volume administered, particle properties and amount received, and the ultimate fate of particles within a patient’s body (1). The appearance of particulate contamination also can be a visible indicator of product quality. Consequently, when such contamination is discovered within biopharmaceutical manufacturing operations, often it triggers costly investigations and corrective actions. The bioprocess industry is evolving from widespread stainless steel systems, which are cleaned and steam-sterilized by validated processes immediately before use, toward single-use systems (SUS) that are not routinely cleaned before use. Particles can be generated during SUS fabrication, transportation and assembly. Cleaning and sterilizing stainless steel systems reduces the risk of particle contamination, especially that from endotoxins. However, biopharmaceutical manufacturers “outsource” process cleanliness and sterilization to the manufacturers of their SUS. Users rely on “clean-build” practices that are similar to those for semiconductors and medical devices, but the bioprocessing industry remains concerned about particulates. So the SUS community needs to address this paradigm shift from end users being responsible for preparation of their equipment to suppliers being responsible instead, even though end users remain accountable to regulatory authorities. Without addressing that challenge, SUS implementation will not progress. Risk of particulate contamination in final products is not uniform throughout upstream and downstream biopharmaceutical manufacturing processes. Most downstream processes contain a number of product purification and filtration steps that can reduce particulate contamination risks substantially. However, single-use components applied downstream of final filters — or in aseptic processes without filtration steps — represent an entirely different category of risk. They require the highest degree of cleanliness with respect to particulate contamination. Vaccines and cell therapies fall into the highest risk category. Practically speaking, what does “the highest degree of cleanliness” mean? Although manufacturing of SUS usually occurs in carefully controlled cleanroom environments, risks do arise for particulate contamination (e.g., through incoming components from external suppliers, cutting and welding operations, and human activity during manually intensive assembly processes), as highlighted in a BPSA guidance (2). As indicated in guidances from the American Society of Mechanical Engineers (ASME), the Parenteral Drug Association (PDA), and the BioProcess Systems Alliance (BPSA) — and in what’s implicit in USP <790> — the overall goal of zero particles is an unachievable specification for both single-use components used in high-risk operations and final parenteral drug products (1, 3–5). As stated by one FDA author, “The goal of end users, regulators, and standards-setting organizations should be to minimize particulates in drug products without placing unnecessary expectations on suppliers for minimal safety gains” (6). Particulate contamination generally falls into two categories: intrinsic and extrinsic. For single-use systems, intrinsic particles come from manufacturing processes and materials (e.g., particles generated in cutting, welding and component joining processes). Extrinsic particles come from the environment and human operators (e.g., dust, hair, skin, and clothing fibers). According to USP compendial methods and studies of visual inspection processes, particulate contamination in parenteral drug products falls into two size classifications: subvisible for particles <100 µm in size (USP <788>), and visible for those >100 µm in size (USP <790>). In this case, visible means that particles can be detected with high probability (>50%) by trained human eyes in easy-to-inspect (clear/transparent) parenteral drug-product containers under controlled lighting conditions. USP <790> also applies to visual inspection of final pharmaceutical products. As indicated above, the probability of trained operators detecting particles >100 µm under controlled conditions is likely to be >50% (5). Because of the complexity, size, and relative translucence or turbidity of materials, the detection probability for particulate contamination on the fluid-contacting surfaces of single-use components typically is substantially lower than that for typical parenteral drug products. rinsing of single-use components with a nonstandardized method for measuring subvisible particles by light-obscuration or membrane microscopy. However, the conditions for visual inspection of SUS have yet to be standardized. And no specifications for subvisible-particle test methods have been standardized. As highlighted in the BPSA recommendations, the bioprocess industry needs a specific SUS particulate measurement method, and “application-specific requirements need to be better defined” (2). The size and complexity of SUS limits the probability for detection of particulates by human visual inspection. Well-developed inspection methods (e.g., operator training and lighting conditions) can be helpful, and the application of automated camera systems could increase detection probability. But visualization of fluid-contacting surfaces still will be hindered by translucent and turbid materials. Consequently, the most promising approach to measuring particulate contamination for fluid-contacting surfaces of single-use components is direct extraction using a liquid. Particles are extracted (rinsed, flushed, and washed) from the surfaces and collected for counting, sizing, and identification. The first step toward standardization of a particulate measurement method would be to standardize the extraction method used to obtain the particles. That method would be useful for either subvisible or visible particle determination and applicable to liquid counting (light obscuration) and imaging methods (flow imaging) as well as microscopic analysis of particles collected on filter membranes. 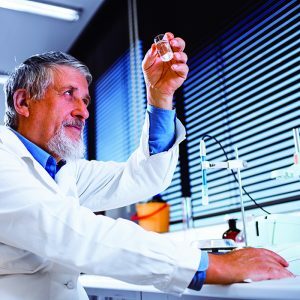 The American Society for Testing and Materials (ASTM) E55.04 Committee (on general biopharmaceutical standards) is making an effort to develop a standard extraction method for SUS. The committee’s working draft is titled, Standard Practice for the Extraction of Particulate Contamination from the Fluid-Contacting Surfaces of Single-Use Components (WK 54630). Given the variety and complexity of single-use components, development of robust particulate-extraction methods is a formidable challenge not to be underestimated. Significant guidance regarding development of particulate contamination analysis methods for complex components comes surprisingly from other industries. The medical device industry’s implantable devices and associated equipment have requirements and present challenges similar to those of SUS. Some particulate limits are referenced, but specific methods and testing rationales need to be justified by each manufacturer or testing organization. The German automobile industry applies a similar approach to that used in pharmaceutical stainless steel cleaning validation. Originally published as guidelines by the German Association of the Automotive Industry (8) and subsequently standardized under ISO 16232 (9), these documents detail approaches for development, validation, and quality control application of methods for measuring particulate contamination. Somewhat analogous to SUS, fluids flow through the components of automotive gas tanks, braking systems, and fuel systems. Particles can block automotive system operations and thus present a safety hazard. The ISO 16232 standards state a clear principle: Particulate extraction methods are never 100% effective at removing all contamination from surfaces. Thus, an extraction method never yields absolute particulate contamination levels, but rather provides only relative levels limited by the method’s inherent inefficiency. For development and validation of an extraction method, ISO 16232 recommends multiple extractions of the same component. An extraction method is considered efficient if through six subsequent extractions of the same component, its particulate level eventually falls to 10% of the initial level of particulates found in the first extraction step (8, 9). Figure 1 shows this approach schematically. Working SUS Particulate Summits in USA and Europe: Please join The BioProcess Institute at these BPSA-sponsored open collegial meetings to discuss the issue of particulate contamination in single-use biopharmaceutical processes. For several years, BPSA has been a vigorous proponent for sharing expertise on and furthering global awareness of particulates in SUS, to benefit both the worldwide bioprocessing community and the people who use the drugs it produces. See the box below for more information. In which bioprocessing steps is particulate contamination most problematic? Is there room for improvement among SUS visual inspection methods? What are the best approaches to measurement of visible and subvisible particles? How do we identify contamination risks in SUS manufacturing? What are some approaches to continuous improvement of SUS manufacturing processes? We would like to summarize the current state of the industry and identify areas that need addressing to improve the overall quality of biopharmaceuticals. Who: Summit leaders are James Vogel, PE (director of The BioProcess Institute) and Klaus Wormuth, PhD (lead particles scientist at Sartorius Stedim Biotech GmbH). Space is limited. Contact The BioProcess Institute (1-401-294-9000, info@bioprocessinstitute.com). 2 BPSA Recommendations for Testing, Evaluation, and Control of Particulates from Single-Use Process Equipment. BioProcess Systems Alliance (Society of Chemical Manufacturers and Affiliates): Arlington, VA, 2014. 3 ASME BPE-2016: Bioprocessing Equipment. American Society of Mechanical Engineers: New York, NY, 2016. 4 Repetto R, et al. PDA Technical Report 66: Application of Single-Use Systems in Pharmaceutical Manufacturing. Parenteral Drug Association: Bethesda, MD, 2014. 5 USP <790> Visible Particulates in Injections. US Pharmacopeial Convention, Inc.: Rockville, MD, April 2015. 6 Langille SE. Particulate Matter in Injectable Drug Products. PDA J. Pharm. Sci. Technol. 67(3) 2013: 186–200; doi:10.5731/pdajpst.2013.00922. 7 USP <788> Particulate Matter in Injections. US Pharmacopeial Convention, Inc.: Rockville, MD, July 2012. 8 VDA 19, Part 1: Inspection of Technical Cleanliness. Verband der Automobilindustrie: Berlin, Germany, 2015. 9 ISO 16232: Road Vehicles — Cleanliness of Components of Fluid Circuits. International Organization for Standardization: Geneva, Switzerland, 2007. 10 Vogel JD. Single-Use and Stainless Steel Technologies: Comparison, Contrast — Where Are They Going? BioProcess Int. 13(11) 2014: S42–S44. James D. Vogel, PE, is founder and director of The BioProcess Institute, 376 Dry Bridge Road, Unit H-3, North Kingstown, RI 02852; 1-401-294-9000; jvogel@bioprocessinstitute.com; www.bioprocessinstitute.com. Klaus Wormuth, PhD, is a lead scientist at Sartorius Stedim Biotech.